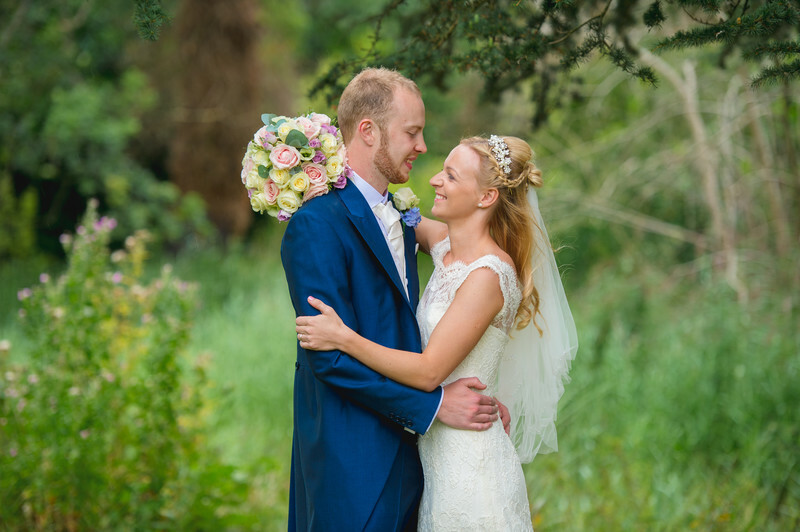 Natalie and Will got married at Manor by the Lake in Cheltenham, and held their reception there too. Manor by the Lake truly is a hidden gem. A idyllic country house wedding venue, surprisingly close to major transport links, not that you'd have any idea of this when you were there. The beautifully kept gardens are surrounded by trees, meaning you can't see anything of the outside world, and you really could be anywhere. After Natalie and Will's beautiful outdoor wedding ceremony, we had to hurry the couple's photos a little bit as it started to rain, lightly at first and then a little heavier as the day went on. 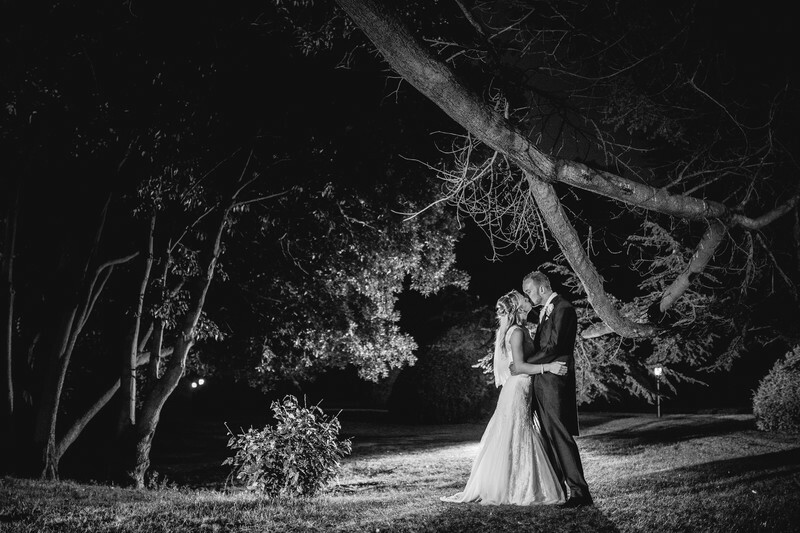 None the less, the photos we took at Manor by the Lake are amazing, and the couple love them. Later that evening, when it had stopped raining and dried out a bit, we took a few more formal photos just outside of the reception room, then went for a little walk around the grounds, just the bride, groom and myself. There are large fairly style lights all around the lake and on the bridge which make for wonderful photos, but one of my favourite places is right underneath this large tree between the lake and the manor itself. There's a large up-light, used to illuminate the trees at night. I stood the bride and groom infront of the light in order to make them standout from the background, and used a flashgun on it's lowest power setting in order to illuminate the side of the couple that was facing the camera. There's a wonderful quality to this image, it's naturally contrasty owing to how the image was lit, which makes a black and white image look much more dramatic than a colour version of the same photo. I particularly like how the shape of the tree's largest branch helps frame the couple in the image. Below is a double page spread from Natalie and Will's wedding album showing some of the images we took in the day before the rain came down. To see the rest of Natalie and Will's wedding album, click here and to have a look at the Manor by the Lake wedding website, click here.